Lovely watch which looks much more expensive than it’s fairly modest price tag. Quality watch strap. Good sized face with lots of functions. Subtle green face. Bought this for my father who absolutely loved it. Seiko maintain high standards and this watch is just as good. The green face is perfectly balanced by the silver surround. A perfect example of high quality, beautiful styling at affordable prices. Bought as a birthday gift, fantastic quality, easy to work , i bought this mainly for the colour and the leather strap, it has grown onto me instantly!! This was a present, which I havent yet given, but it looks beautiful. Comes in a lovely box with a manual and looks very special. Very pleased with it so far! Very nice watch, I absolutely love the combination in between the brown strap and the green dial. Excellent quality as expected for a Seiko watch and the dial reminds of old ones. An excellent watch. All features are incredibly useful and the design is crisp and classic. The green face stands out as something slightly different than the ordinary a twist on the contemporary. A stylish time piece which looks more expensive than it was. The dial is clear and the large hands make it easy to read. The stopwatch and alarm functions make it versatile as well as good looking. The rich brown leather strap adds to its expensive appearance Im looking forward to some good times from this splendid watch. Fabulous, brilliant, very fast delivery, thank you watch shop my husband will be so pleased Xmas day. I had previously ordered the watch from another company , I didnt get the watch and I doubt I will get my money back. I will Never order a watch again from any one but watch shop. You have put a smile on my face as will my husband Xmas day. 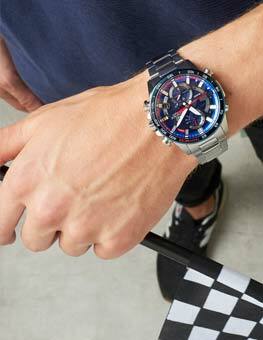 A great watch that actually looks as good on ones wrist as it does in the pictures shown. An absolutely beautiful watch with a shimmering green face, the gold hands stand out exceptionally well against the dial making it easy to tell the time even in low light and if there is no light at all the luminous markers allow you to see clearly the hours and minutes. Perhaps the only drawback with this timepiece is that it does not have a s/steel bracelet option, but that is just a personal preference. Love the green face - a classic watch with a twist. Nice brown strap and overall quality product. 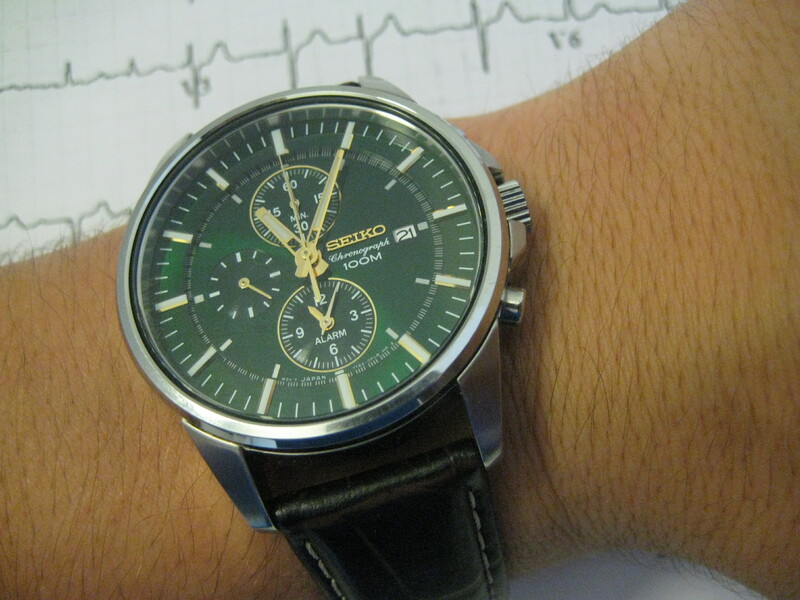 I bought this watch to wear day to day, and to wear in hospital while studying to be a doctor. For this purpose its useful to have an alarm and a stopwatch, and for it to be easy to take off on the ward. The watch came presented in a white, classy Seiko box that would be great to open if it was a gift. The instructions included were clear and concise. The strap is a lovely dark calf leather with white stitching. The clasp seems strong and is highly polished. The strap was initially quite stiff, but the leather broke in very quickly and is now soft and comfortable. I have quite small wrists, but this watch fits fine and looks like it has a wide range. The leather loops on the strap retain the end well. The case of the watch is silver, and the bevel really looks good. There was enough space on the back to have my name engraved. My only concern is that the glass is quite flush with the bevel and I am worried about scratching it. The knobs and buttons are easy to use but not easily knocked like on some slimline watches. The markings on the watch are crisp and glint as the watch is moved, but not in a gaudy way. I really love the subtle handwritten font Chronograph underneath the Seiko logo. The colour of the face is a very dark green that works well with a lot of outfits. The dials are gold coloured, and there are three miniature dials showing elapsed stopwatch time, alarm and seconds. I was surprised when I discovered that the dials are luminescent, and really pop out in the dark. The date is shown but might not be suitable for someone with poor eyesight as it is quite small. On to the function! It keeps perfect time as you might expect. The date and time were a little tricky to set at first but once I had the hang of the dial it was fine. I must admit I am not too much of a fan of the stopwatch mechanism. It has a split function, but I think this just complicated the process of resetting it and I would rather it was just a simple stop/start and reset. This doesnt really bother me very much though. I havent found the alarm very useful as it lacks the flexibility of a phone alarm and cant be set more than 12 hours ahead. The watch comes on and off easily but would never fall off. I have taken it into the shower and swimming pool and it remained waterproof rated to 100m. In conclusion, Im very happy with this watch. Its ideal for a professional workplace, but I wouldnt take it on anything too adventurous due to the exposed glass face. The stopwatch and alarm work well but are a little overcomplicated. Personally, I think the watch looks fantastic and performs well. It seems well made and I look forward to using it for years. I was looking for a chronograph watch with an alarm for daily use and after thorough consideration I ended up to this Seiko. Delivery was as promised 4 workdays to Finland. Golden hands fit in perfectly with the nice green color of the dial. The tone of the dial is nothing too bright but a very elegant one. A really beautiful watch. the emerald green is gorgeous and emits different shades of green in different lights. 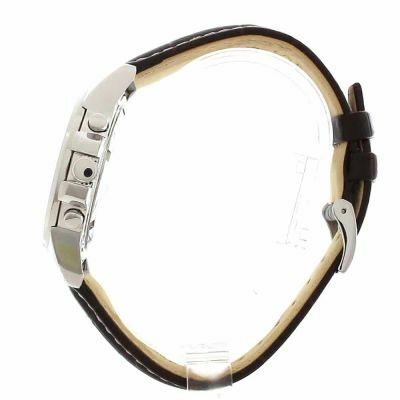 the leather strap is of high quality but does take some time to fit your wrist. the alarm is has a nice tone not a standard bleep. dials are very clear to see even the stop watch milliseconds. It stands out among other watches and is an excellent bu. cant go wrong with seiko mechanics either. Little to add - the item is as expected and does what it should i.e show the time & date after a VERY short time of evaluation it seems to do everything correctly. So as of now all satisfactory!! !